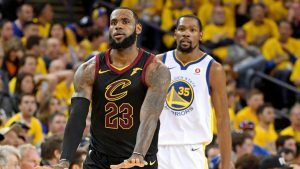 Golden State Warriors, who were the defending champions, won the first game of the NBA finals in overtime with a score of 124-114 against Cleveland Cavaliers. Game one between Warriors and Cavaliers was played at Oracle Arena in Oakland. 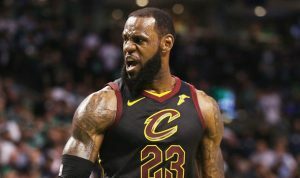 It was a thrilling match as everybody witnessed the exquisitive performance of Lebron James, who scored 51 points for the Cavaliers in the whole match. However, on the other hand, Stephen Curry of Golden State Warriors scored 29 points for his team. This was the fourth time in a row that the Cavaliers were defeated by the Warriors in the game one. 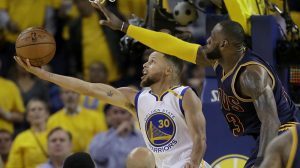 Allsportspk presents to you the match highlights of game one of the final match played between Golden State Warriors and Cleveland Cavaliers. As soon as the clash of Warriors vs Cavaliers began, Cleveland grabbed the first two baskets in just 4 mins. The Cavaliers were playing well but Warriors struck back quickly and in a very less time and the score was equalized 6-6. Both the teams were going at a fast pace as the score was tied to 15-15 just after 10 mins. After half an hour, Klay Thompson got injured by JR Smith who accidently stepped on his leg. After that, Klay got out and the game continued. At this point, the scores of the Cleaveland Vs Warriors match was 30 – 29. Both the teams were trying to outnumber each other by a big margin but the difference was only of one point between them. Despite the injury, Klay Thompson got back in the game and scored a three pointer, after which Lebron gave Cavaliers 4 straight points. Cavaliers were now leading by 9 points over their rivals. Cleveland Cavaliers tried to build up the score but the Golden State Warriors struggled hard and came back with just 3 points behind Cavaliers. The score became stagnant at Cavaliers 51-48 Warriors. And, at this moment Stephen Curry scored just before half time, as he levelled the score at Warriors vs Cavaliers (56-56). Lebron James from Cavaliers and Stephen Curry from Warriors were mostly scoring points in the game. As the second half started, the Golden State Warriors flipped the game and lead the Cavaliers by 68-63. At this point, Warriors were ahead of Cavaliers. This when Lebron James came back in action and scored a seven-point run for his team and the scores were levelled now Warriors vs Cavaliers (68-68). The game was becoming more exciting as both the teams were scoring at a fast pace. Whereas, Lebron tied the record of Michael Jordan of 30+ points in the play-off history. After some free throws and some good baskets by the Warriors, the score was Cavaliers 75-82 Warriors. Kevin Durant extended the lead for Warriors and Klay Thompson on the other side scored a three-pointer again. The third quarter was about to end and Warriors were still leading by 6 points. Warriors got the advantage of their home so Cavaliers and especially Lebron James really need some baskets to cover the lead. The fourth quarter started and the score reached to Cavaliers 85-89 Warriors. Lebron was dunking some baskets and 10 mins after the start of 4th quarter, Cavaliers were leading with one point to Warriors (92-91). After a few minutes, Draymond Green and Stephen Curry from Warriors replied them back with a three-pointer and now they were leading by 6 points to Cavaliers with only few minutes left in the match. Lebron James took the lead for Cavaliers by 104-102 and Lebron’s points were now 46 for his team. The score then reached to 107-107 and the ball was in JR Smith’s hand with only 4.5 seconds remaining on the clock. Instead of scoring, JR dribbled and lost the ball to Warriors. Due to Smith’s misunderstanding, the match continued to overtime. Warriors lead the Cavaliers from 7 points after 4 mins of the start of extratime. The Cavs were trying their best to score but the State Warriors weren’t easy to handle and the score reached Cavaliers 109-119 Warriors. 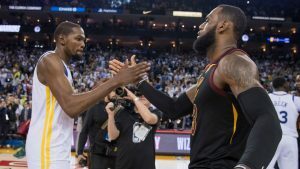 At last, JR Smith and Lebron James netted some balls but Warriors were leading them with a big margin and the match came to an end after the whistle. The main scorers of the match were Lebron James and Stephen Curry who scored most of the points for their team. The final score was Warriors 124-114 Cavaliers. It was an amazing match to watch as both the teams were scoring immediately as soon as one of them got in the front. That is it for now. Do join allsportspk on 4 June for Game 2 of Warriors Vs Cavaliers.